Hate to say it, but synoptically we live n die with Chicago more than not. Us getting shlammered and them nothing just goes against that grain! GFS is wagons east. I hope the Euro is West. Let the battle go a few more cycles. Might be LOL worthy today, but as said by others, we've had virtually ZERO test-case examples of how the current model upgrades are handling something as potent and unique as this strong neg-tilted Gulf Low. Idk what to think, lol. Not sure what CPC was smoking Tues pm when they issued their outlook after EVERY model shifted well east all morning up to that point, but per their map mby is shown very close to the rare tri-fecta of conditions I drool over..
Anyways, like most gov agencies, they prolly just go thru their daily motions and had this all drawn up in the morning and didn't bother revising it. Sure today's will be like "what storm potential over MI??" Good luck over there with the LEffect! Believe me, I’m already thinking about warm weather thoughts...before that though, I’d like to see an impactful strong southern wave hit us by March. To the extent that mby over to your's and/or Tom's gets hit - a resounding YES. No way it comes back this far west. Niko can hold out hope tho, and I would if I was him. I am liking the lake effect potential where I am. May have pretty good duration, starting as early as Friday afternoon before swinging west (maybe out of my area) but then coming back east and peaking on Saturday. Inversion heights aren't the greatest but despite that, I think several inches is on the table here/close by. Forgive me if I have my doubts after seeing this potential trend the way it has. Perhaps in Nino fashion, we finally get one on the threshold of spring..
W the arctic blast coming this weekend, you stand a great chance of getting some Lake Effect for YBY. Hope not, I'd like to get my lawn decorations put away. 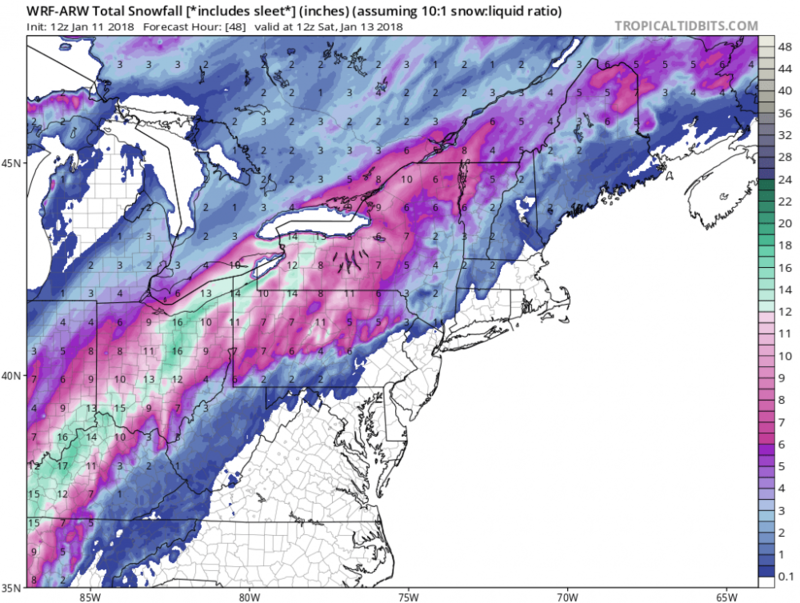 They should be released from the glacier by then..
Areas at greatest risk for receiving enough snow to shovel and plow after a period of ice will extend from northern Tennessee to southwestern Ontario. The area includes much of Ohio and may reach the major cities of Cleveland, Cincinnati, Pittsburgh, Detroit and Indianapolis. However, a slight westward or eastward shift in the track of the storm and the progression of the cold air may cause the heavy snow areas to shift correspondingly. All eyes for any changes in the models in the upcoming days. Yeah over your way. At least mby got that (1) Dec storm in Dec of '16 for a warned event. Still keeping an eye on the backside changeover to ice/sleet/snow. 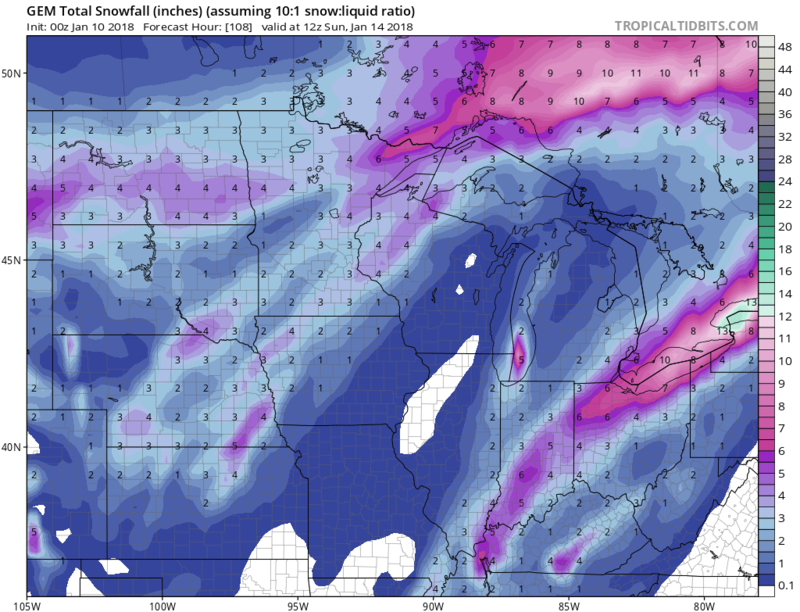 Not talking big amounts but some of the hi-res guidance is a little more bullish with it. Shame that next to nothing will come from such a dramatic thermal boundary..oh what could've been in another era. south- southwest pending band orientation, into northwest Indiana. convergence likely to produce changes on areas most impacted. well south of the Kankakee River in Indiana. but there will be fairly strong winds through the layer. for mesolow development that could slow eastward progress. visibility in areas that receive appreciable accumulations. Unfortunately that lake band will probably not affect us farther west of the city but it might give you a little snow Tom. Not betting on it, as we would need a better easterly component. Would have been a better set up if the SLP was stronger to our south but that doesn't look like its happening. These LES events are nowcast anyway so if anything that falls will be bonus IMO. Interesting, indeed! Correct me if I am wrong, but it seems a little further NW than yesterday. 12z 3km NAM for compare..
Sweet! I think the models are having a betta handle of this today, now that the disturbance is onshore. You should bold well w LES this weekend. Sheesh this is KRAZY nuts..like back from the dead Zombie Storm! Sheesh this is KRAZY nuts..like back from the dead Zombie! I wanna say that each run on the models is a mb stronger and a few miles further NW. Yeah, this ain't ovva! One of those down-to-the-wire systems that we've not had in some time. I'm no MET so this is over my head, but I've read enough AFD's to recognize that there's some room for more changes/positive results from these IWX words..
idea of the NAM`s increase in QPF (including the FWA area). ice accumulations beyond those forecasted at this point. You betta believe it brotha! Still holding out hope it jogs a few miles north.....would love to get in the action!! 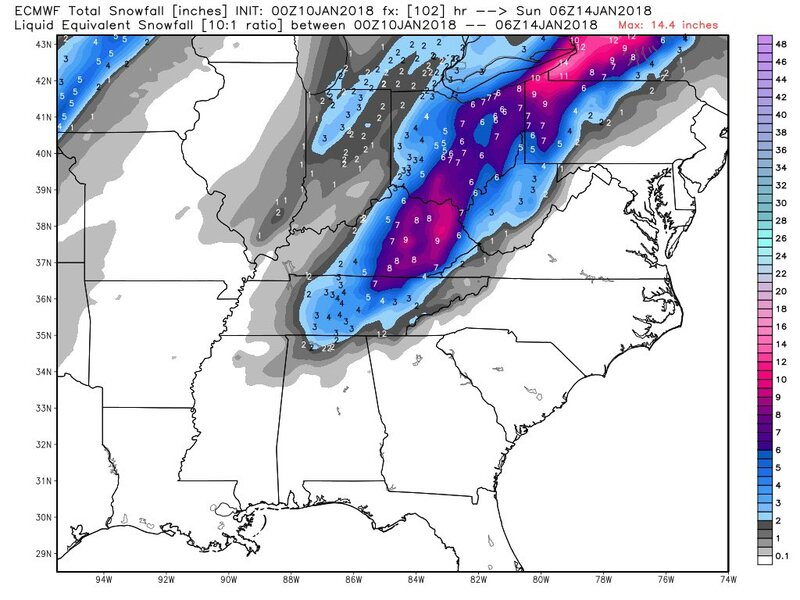 Btw, translates to about 4.5" depth, which prolly allows for mixing issues, etc..
Toss a dart..just as likely to be where the weenie band sets up, just as we've seen with part-1 today..good luck. 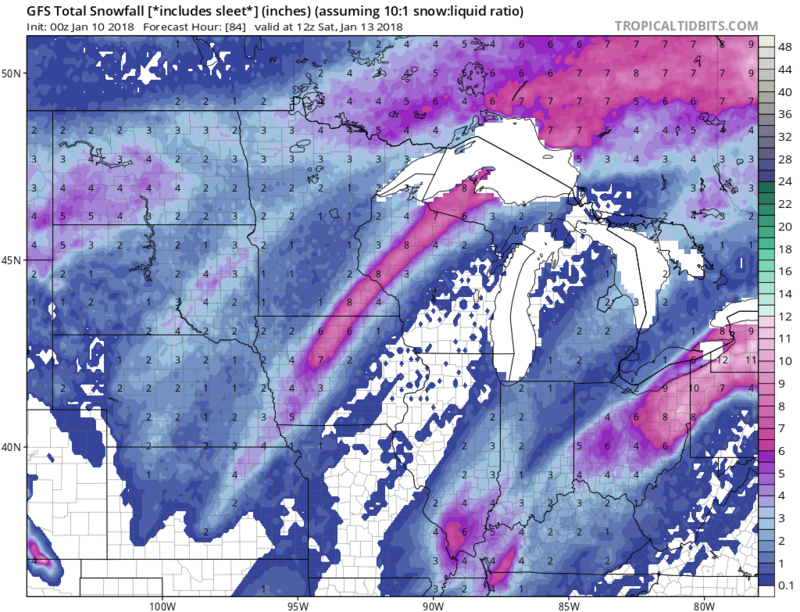 Even GFS trend wants to deliver 3.5" so trend's been a friend all of a sudden. WOW...looking good there Jaster. Hopefully, that darker blue slides my way. That has to be extrememly heavy snow. Under a WWA for 2-4inches or more. RPM model trying to paint a couple inches of LES in E Cook county Friday night and more so across NW IN...it'll be interesting watching this unfold and to see if a lake plume does in fact develop. evening as low level flow weakens and backs more westerly. What a dramatic flip in temps from last night. Just took out the garbage and its friggin' cold! Actually, I saw some LES flurries falling from the sky. The ground is completely frozen solid. Looking at the radar, Lake/DuPage/Cook county are getting some flurry/light snow action....albeit, very light, this is something we have to monitor as we get into the evening hours.